Lovely to deal with when getting your property and during the period of trying to sell but in the end nothing happened. A vendor was selling a 3 bedroom House and found Shane via OpenAgent to sell her property. This agent has energy and drive. He said 2 weeks to sell the property and so he did. Kept in contact even after open house he rang to give feedback. Answered all questions. 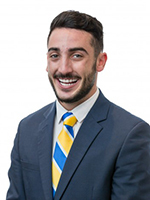 Shane Spiteri has sold 54 properties in the last year. They’ve recently sold properties in Harkness, Kurunjang, Melton South, Maddingley, Melton West, Pentland Hills, Darley, Melton, Brookfield, Eynesbury, Mount Egerton, Hopetoun Park, Truganina, Bacchus Marsh. A recent sale was a 4 bedroom house at 107 Long Tree Drive, Harkness. Their highest sale in the last 12 months was a 4 bedroom house in Bacchus Marsh for $2,000,000. Shane Spiteriwill get back to you shortly. What can Shane Spiteri help you with? Looking for more agents in melton?